Where to begin.... I'm no starnger to the BBC Micro or the Electron, and I'll never forget that day as a 13yr old teenager back in the 1980's as I waitied for my shiny new BBC Micro to arrive. I'd messed around with a few different things before that, Namely a ZX80/81 and a spectrum, I even had an Atari 800XE and and a TRS-80 at one point in time, but nothing was as great as the day that BBC MOdel B micro arrived (Somewhere round about mid 1983/84) that big square beige box set me on the path to wreck and ruin with an unhealthy obsession in I.T. that I'm on today. 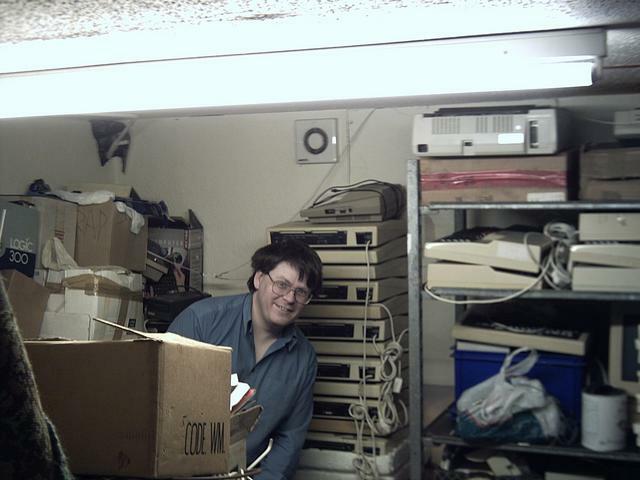 For the longest time, life, work, education, family etc got in my way, but I always continued to do things for the BBC Micro, even if it wasn't out and out obvious, I did join the Raspberry PI forums when that appeared, and I did make the odd appearence on the RiscOS open forums too, but I largley stayed hidden for what ever reason. It had apparently laid forgoten in the bottom of a box of papers that chris had from me many years ago, well I'm pleased to say, yes it was mine, and that prodded me to start playing about with BBC Stuff once again. On the back of that, I ended up getting back in touch with Chris, and even got to say hi in person again after not seeing him for about 15 years when he passed by my town on a motorbike tour. I do however have just about every emulator going, every disk image going (Including images of all my own stuff I wrote over the years) and PDF's of just about every manual, book and user guide for the BBC. The thing I'm probably most known for was the "BBC Dreamscape Demo" (Which would never have happened if not for help from Henley of The Yorkshire Boys), if you've not seen it there's a video of it on my youtube page. There's quite a few disc images of mine floating around in far flung corners too, most of my stuff was sent to Chris Richardson for inclusion in the 8BS catalog and if memory serves me correctly where all available under the TBI-55 section. The thing I am doing at the moment however, is to redraw the BBC Model B circuit diagram fully, in Autocad based on the original gif images floating around on the internet, it is as you can imagine a long process, and time is frequently not my friend when it comes to indulging in things like that, so I will probably release that on Github too, I've even got some of the circitry modled using "Digital", so that you can see it operating in a virtual environment, but I'll post the details of that in the hardware section of the forum. I'm going to leave it there for now, but suffice to say, I'm going to pop my head up a little more often now, and hopefully maybe even start to contribute to the BBC Scene again. Last edited by shawty on Sun Feb 03, 2019 5:02 pm, edited 1 time in total. I've only been a member myself a short while. Everyone here has been incredibly friendly and welcoming and what's more seem they are a highly knowledgeable bunch too! Very nice! If you happen to have a .SSD file I'd loe to see that running natively on my own Beeb? Hope your enjoy it here and we'll see you around no doubt! There's various copies of it floating around on the emulator sites, some original, some I updated in I think about 2000 to remove old address info etc. I've just made this post: viewtopic.php?f=12&t=16451 for my HTML script to list DFS images I wrote last year. In the github repository is a "disks" folder set up to demo how to use it, and in said folder is an SSD Image of the demo. A blast from the past, welcome! and I'm sure I've got and use other stuff you wrote. Is it the one in 'JGHMusic2'? It certainly is Johnathan You still got the Attic cave, with the steep set of ladders in the cupboard?? It's been a long time since we've spoken my friend. Pleased to meet you Multi... I'm long overdue landing myself here. Just been having a poke through it all, I actually forgot I'd remixed so many of those basic programs. Loads of Laughs, they where some good times. Super thanks - I'll give it a whirl tonight. You really do need to get a real BBC. Your right, I do need to get another one, I just don't have the space at the moment. 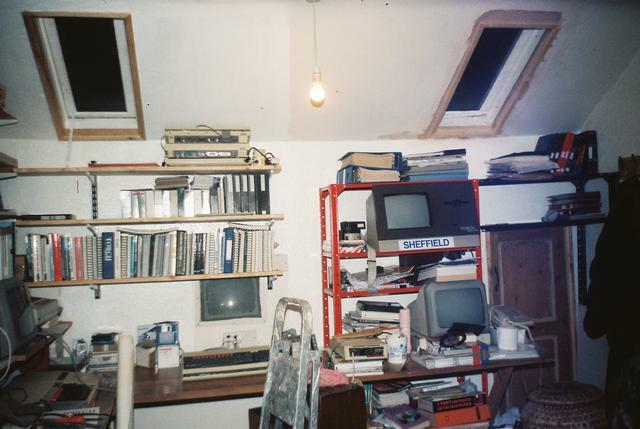 I'm intending to make some space up in my loft to build another desk up there, so once that's done I probably will end up getting another one. I also need to repair my Archie too, which I do still have. It certainly is Jonathan You still got the Attic cave, with the steep set of ladders in the cupboard?? Ha ha ha, no not quite. Last time we spoke in person, you where way up in a very small loft space in your house in sheffield, and you had what could only be described as resembling the entrance to a submarine as one of the entrances... if memory serves me right, you had 2 wardrobes, and a ladder each side to get to each of the two desks you had. If you had a basement then, I don't remember it. PS: Your picture doesn't actually show up in the post on my browser for some reason, I had to grok the URL from the quote while composing. I couldn't get your github to load on my phone, so will take a look later. Do you have the disc images set to launch in jsbeeb? As you have been here a while, I'm sure you are familiar with the bitshifters, but if not, take a look at their github. I always used to complain about demo coders not making games, but I do understand the lure of the technical challenge. Why do you think most demo coders don't make games? You know that's actually a very, very interesting question, and one that I can only really answer from my own point of view (Bearing in mind that this is at least 25 years after the fact too). For me at least, I was a typical teenager, I never really had the tenacity to finish anything, one minute I wanted to push the video chip, then I'd read something that made me want to try an experiment with the sound chip. Then I'd get onto a BBS, and someone would send me something, and that would spark off another journey in an entirely different direction. I was just way too busy exploring and experimenting to actually commit to producing anything longterm, and so demos where more my game. In my mind, just as a great artist doodles things, a good programmer "makes demos", they are in essence a programmers doodles. I do hope you get chance to start coding some more demos again - we’re certainly trying to bring about a bit of a renaissance and perhaps a reappraisal of what the humble Beeb is capable of compared with our 8-bit peers. Spare time and RL notwithstanding of course! As for BBS’s I don’t recall the Electric Shed but spent an inordinate amount of time on CCl4 and other Viewdata boards in the North of England back in the 80’s. Awesome, I'll have to take a look. Are you North East located? Who knows, maybe I will write some new demos for the Beeb, It's been a long time since I did any serious 6502 code, in terms of "Nice Architectures" I spend more time with Arm these days than 6502. Still when I was online, I had quite a few folks on it, I would say there was about 20 regulars, and maybe another 30 or so on top of that, who would come and go. I'm surprised you didn't run into me on CCL4 however, I too probably spent more time than was healthy on there. Made you feel like a Tank Commander being in there. I'll have to find you some updated photos of me... ha ha.